Running a shop this awesome is no small feat. We couldn't do it without each one of these one-of-a-kind team members. The shop's fearless leader, Jeff, hails locally from Cross Keys, Virginia. He is a graduate of Spotswood High School and holds a BFA in graphic design from James Madison University. Jeff has over a decade of apparel design experience and in his spare time, enjoys creating art, watching live music, and climbing mountains. He and his wife Emily have 2 children: Afton and David. Susie has been a co-owner and mainstay of the Mark-It since October of 2010. 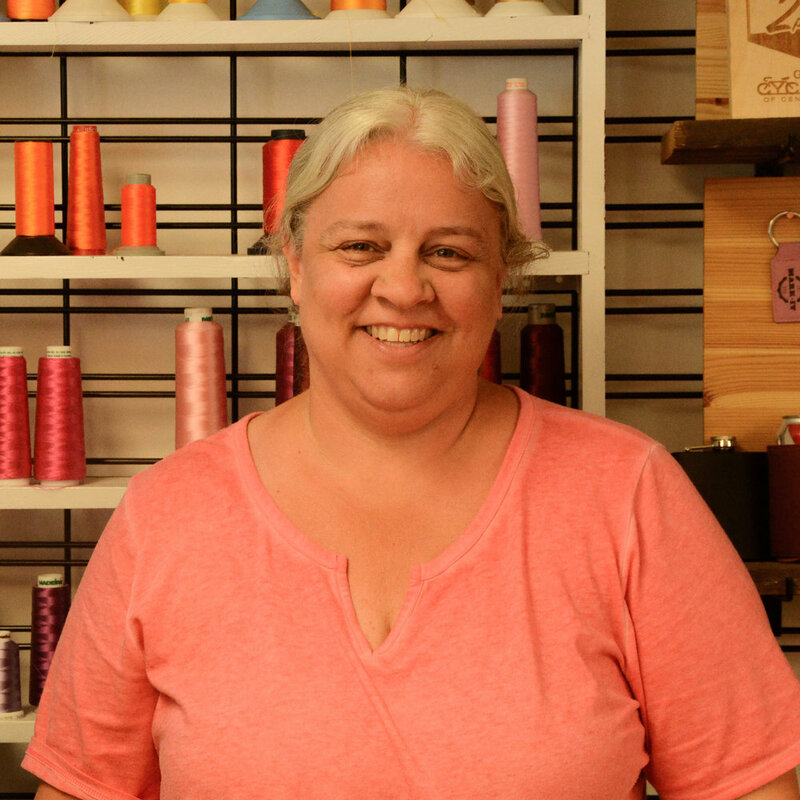 You have her to thank for just about anything you've had embroidered here at the shop! She grew up in Waynesboro, VA and moved to Harrisonburg 26 years ago. Susie and her husband Marty own a turkey/beef cattle farm and have three kids: Logan & Seth who also own a turkey farm, and Kelsi, a Junior in High School. 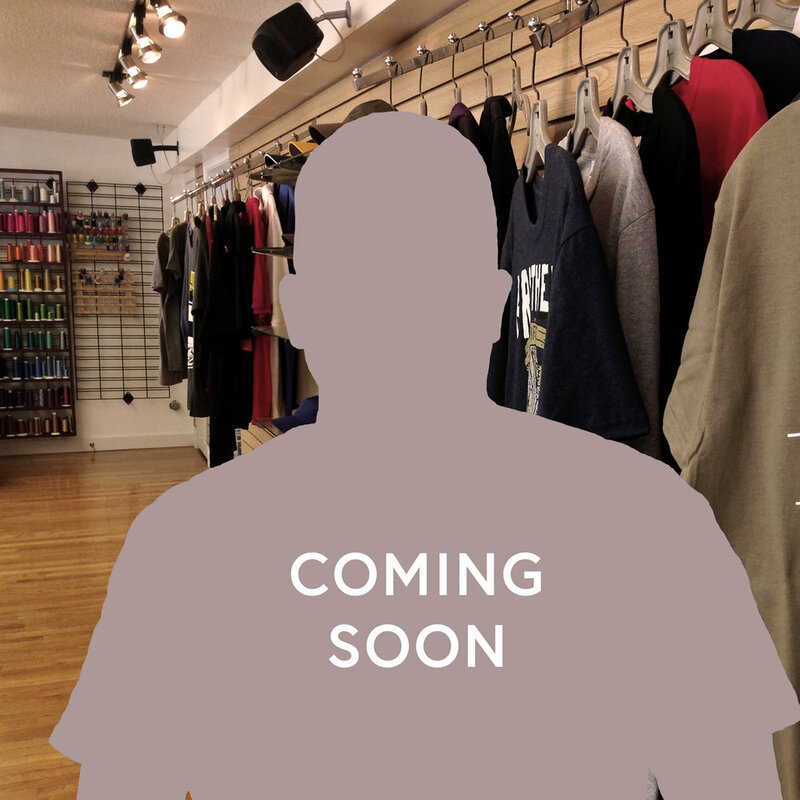 Working at the Mark-It since 2002, Edwin is the longest-standing employee at the shop. He's our go-to guy for technical screen printing questions, quick fixes of broken things, and candid movie/anime reviews and recommendations. Edwin's home town is San Sebastian, El Salvador. In his spare time, he enjoys keeping a saltwater fish tank, playing soccer, fishing, and spending time with his wife, son, and daughter. The moon is her hometown. The screen printing floor is her domain. She enjoys short jokes, dogs, cats, wood dust, printmaking, & plants. This is who we can thank for all of the beautiful green plant life around the shop that cleans the air and keeps the place feeling lively! Eirotropot is also a prolific and talented artist who regularly graces the city of Harrisonburg with beautiful murals and art exhbitions. Praveen is the mastermind behind the laser machine, and he is one of our incredible screen printers as well. Praveen's home town is Kathmandu, Nepal. He plays guitar in a heavy metal band called Earthling (a local favorite) that tours all over the states once or twice a year. He also enjoys cooking Nepali cuisine at home and watching European club soccer--he hasn't missed a Manchester United game since 1999! Praveen can speak, read, & write in three languages: English, Nepali, & Hindi. Catherine helps to run operations around the shop, starting with customer service and continuing through to the ordering, scheduling, and artwork prep stages. Catherine’s hometown is Weyers Cave, Virginia, but she made the big jump to city life in Harrisonburg after attending James Madison University. She’s a Valley girl through and through. Her hobbies include consuming content (books, TV, movies, the Internet) and finding ways to use the all of the crafting supplies she owns. Definitely in the running for coolest employee, Neil holds down all kinds of different tasks on the production floor -- from cleaning screens to sorting orders to printing tees. He is from Staunton, Virginia and his hobbies & interests include Rock and/or Roll. Neil is a dog person.